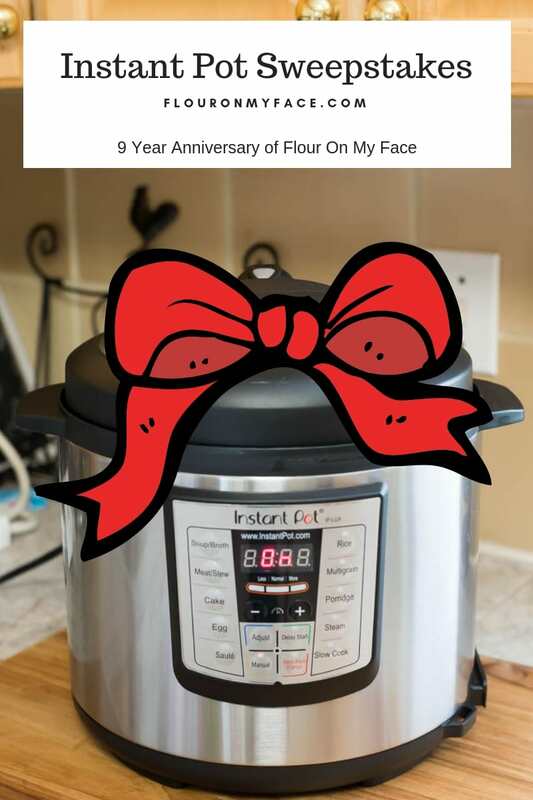 I am hosting an Instant Pot Sweepstakes in celebration of my 9 year blog anniversary! The Instant Pot Sweeps is open to anyone 18+ and living in the USA. Disclosure: This Instant Pot sweepstakes is not sponsored or endorsed by the makers of the Instant Pot. I will be paying for the prize myself. I was planning on posting this Instant Pot Sweepstakes next week but because my internet was out for over 5 hours today and I didn’t get to finish writing the Instant Pot Chicken Noodle Soup recipe I was planning on posting this morning. Instead, I decided to share this Instant Pot giveaway a week early because it is faster to write this giveaway post than it is to finish writing the chicken soup recipe. And I am tired! It is after 12 am and my eyes are burning! On October 8th the Flour On My Face blog will turn nine years old! It is really amazing that I have been sharing recipes for 9 years. As a gift to you, my reader, I want to offer you a chance to (affiliate link) win a 6 quart Instant Pot. One randomly selected winner will win the Instant Pot DUO60 6 Qt 7-in-1 Multi-Use Programmable Pressure Cooker, Slow Cooker, Rice Cooker, Steamer, Sauté, Yogurt Maker and Warmer. I have a similar Instant Pot model that does not have the yogurt maker setting. I’ll be sharing a bunch of Instant Pot recipes in the upcoming weeks and I know some of you don’t own an Instant Pot yet. This is my way of saying thank you for being a reader and sharing my food blogging journey with me for all these years. I will have the Instant Pot shipped directly to the winner from Amazon. Good luck and thank you for being a Flour On My Face reader! The first recipe I would make is carnitas. YUM..!! I would make ribs in this first. Happy Anniversary and I love that you are sharing your recipes with us. I am a recipe junkie and love trying all sorts of new recipes. You have taught me a lot over the last few months that I have been following you. My meal planning and prepping has come along way and BONUS I have actually lost a little bit of weight as well. I guess my next step is to get a instantpot….any good suggestions. I know you mentioned about the yogurt part but any other helpful hints would be awesome. I didn’t realize there were so many out there. Thanks again for all your hard work and have an awesome day! We received about 4″ of snow last night and still snowing as I am typing this, so some nice warm soup or stew would really hit the spot the next few months. Again thanks for sharing and look forward to many for years. I would make corn chowder. I’ve heard a lot about Instant Pots but haven’t had the money to buy one. I’m intrigued! Thanks for the chance to win. I would like to try potato salad where you cook the eggs and potatoes together in the instant pot. I would love to make soups in the instant pot if I won it. Several of my friends have one and love it and I’d love to add this to my collection of cooking appliances. If you win what will be the first recipe you make in your new Instant Pot? How exciting! I don’t have an ‘Instant Pot’ and I’m a foodie & kitchen freak!! I would probably start with cooking a whole chicken and do my food prep! Then I would cook a roast (aka “Mississippi Roast’!! I’m dying to try a cheese cake in an Instant Pot, so that’s the first thing I’d make. I would make Spicy Beef Enchiladas with the instant pot! I would love to cook any dried beans. They are so easy in the pressure cooker. Forgot all of that time soaking. Also, so economical! I love my beans with brown rice! Sonya I haven’t tried cooking dried beans in the Instant Pot yet but that is one of the reasons I bought mine. I’ve seen some really good chicken tikka masala recipes and also chicken noodle soup sounds yummy with fall here now! I’ve been eyeing some recipes for barbacoa beef that looks and sounds tasty. Its something my kids would love for me to make! Hi Arlene,I love your blogs, recipes, and meal plans. I live alone, so it is sometimes hard to just cook for one person. All my girls are grown with families of their own. I love writing. If you ever would like a little help with your blog, please let me know. I have been thinking of writing one myself. I am so happy you enjoy the recipes. Soup, Chili and Stew recipes freezer well as long as they don’t have noodles or pasta in them. You can make my 6 serving recipes and freeze them in individual containers. I love these (affiliate link) plastic containers and buy them about twice a year. I always freeze some of my soup recipes so I can enjoy them later. Arlene, I am a “soup-aholic,” so I probably would make soup. My 2nd would be a chicken recipe. I love soups and will be sharing some Instant Pot soup recipes in the coming weeks. The first thing I would make is baby back ribs. The first thing I would make in my new Instant Pot Pressure Cooker is BBQ ribs. My family loves them and since we are really busy with activities, making them in the Instant Pot would save time and energy. Love Flour on my Face! If i win the pressure cooker I am not sure what I would make since I have never used one before. It would probably be a stew of some sort. Gotta be chicken and rice. It’s that time of year. I want to make my grandmothers fresh green bean soup!! What a wonderful way to celebrate your anniversary! Thanks for the opportunity! Thank you Sandy! Good luck! Wow! Great give away. Congrats on 9 years! Thank you Lorene good luck! Nice blog. Thanks for the recipes. Thank you for giving us a chance to win this. Your recipes are always great . I will make some of my beef stew in it first if I won! I will make a yummy beef curry! I would make fall off the bone baby back ribs for my husband. He has some friends over on game days. Sure tobe a hit. Ellen the Instant Pot is great for game day food. I think my first item made in the Instant Pot might be good ole’ Ham & Beans. I’ve been wanting to get an Instant Pot for that purpose. AND October 8 is my Birthday! Hope I win~~I know there are lots of things I will cook in my Instant Pot when I get one: Curry Chicken, Green Chili Stew, Cheese Soup, it’s an endless list! I am new to your page but really like what I have read so far. As for the Instant Pot, I believe the first thing I would try would be a pot roast. I’m not big one making one in a crockpot all day so the Instant Pot would be a good recipe to try. I would love to try some soups in the instant pot. I’m thinking lamb stew for my first try with the instant pot. If I won the instant pot pressure cooker, the first thing I would make is a great recipe from your blog using chicken. I would love to win an instant pot. The first thing I would make in it would be a nice spaghetti sauce or marinara sauce. If I win, the first recipe I will make in my new Instant Pot is my Chile Colorado Beef. I’d like to try some of your recipes with Instapot! I would love to win an instant pot. I would make a nice spaghetti sauce or marinara sauce. I’d love to try making yogurt, especially with a fall flavor like pumpkin. I have heard great things about the Instant Pot, but have not added one to my kitchen as of yet. I hope whoever wins enjoys it greatly! Was just wishing I had an instant pot because I am using my old fashioned pressure cooker to make Beef Stew for my son and I today! Hi, Arlene! I LOVE this INSTANT POT 6 QUART PRESSURE COOKER! What a neat appliance to try! I would make soup, chili, and maybe even try yogurt! This is a really cooker – even rice! I love so many of your recipes – what a great pot to use it for your recipes! A wonderful pot – I’d love to have one, please! Thank you! I would probably get up enough gumption to try a cheesecake. The directions I saw for making one were scary! I don’t have a clue what to make first! I’m new to the Instant Pot craze, but have been hearing many happy owners sing its praises. I would like to see if I could make my french onion soup in it. It has multiple steps and it would be really interesting to try in this. The first thing I would cook with it is Chili. I recently saw a recipe for Instant Pot meatloaf. My nephews love meatloaf, so I think I make that first. If I were to win the Instant Pot, I would make a pot of Beef Soup! I love that you are giving us a chance to win an Instant Pot! I would love to try making some of your recipes in one. Thank You! The first thing I want to cook in my instant pot is oxtail. That is an interesting choice of recipes. I haven’t had oxtail soup since I was a kid. My very German grandmother made it all the time! Good luck! Well, maybe it would be your chicken soup that you worked so hard on and will post soon. Or maybe beef stroganoff. Thank you for the opportunity. And happy 8th to you! Hi Leslie I hope to have that Instant Pot Chicken Noodle Soup posted next week! Good luck! Black beans and rice! Or hard boiled eggs. Pot roast or chicken tacos! Love your recipes! I would make beef stew. I would make turkey stew. I am looking forward to making your chicken wild rice and mushroom soup! I am sure its going to be amazing! Good luck that Instant Pot Soup recipe is amazing! There are many things I would love to try! Maybe some kind of stew or roast beef? Mary Good luck. Feel free to share the giveaway with your group or friends! I would love to make an old fashioned roast!! Thank you for your recipes & I’m looking forward to many more. I love using my I Pot. There are just two of us and I make so much that I share. I’ve never left a comment anywhere so I hope you ge this and note my sincerity about your recipes. Love your recipes and the blog! I would make the Macaroni and Cheese! My family would go crazy! Love it! I think I will start with chili. Mmm, but the pumpkin soup recipe looks so tasty! Maybe I will make some pumpkin chili. lol Happy 9 years! 🎉and thank you! with the holidays coming up, i would make your candied sweet potatoes! The first thing I would make would be Korean Beef. I would make veggie stew! I’d love to make some chicken & dumplings in it! I’d like to make beef stew. I would make split pea soup first. I would make cream of broccoli and cheese soup. I would love to make some kind of pulled pork or chicken recipe and then find some fun desserts! I would probably start with a pot roast! I think I want to try a nice homemade beef stew, perfect for the fall weather. I would make beef barley soup first. The first thing I would make would be beef stew. I am hoping to win this for my mom. If I do, I will have her make Chicken Tiki Masala. I will start with something easy like Chili then I will be looking for help/ideas!! I want to try the carnitas and the chicken noodle soup. They both sound and look delicious and I just can’t make up my mind. I would make beans—lots of beans…TexMex beans! The first thing I would make is black bean soup. I would love to try Chicken Corn Chowder in the Instant Pot. The first thing I would make would be pulled pork. I would make the orange chicken recipe I have been seeing around social media. Thanks for the chance to win this. I’d want to start with something simple to try it out. So I’d love to try making potatoes in it. Yum! Thank you for the chance! I would love to make a soup or chili! I would make beef & barley soup. Would love to make football chili for a Sunday game. Hi! I would probably try whatever meal I am. Poking for tonight, maybe chicken etc. I would love to try ramen noodles in the Instant Pot! I hear it really brings out the flavors. I think I’d try a roast! I will make beef stew. I’d make mac and cheese. I’m in bad need of pot roast. That’s the first thing I would make. I’d make pot roast with potatoes/carrots! This looks amazing. Now I’m starved! I’ll make a pot of chili. It’s cold here! If I win, I would like to make a vegetable soup. I would love to make chicken tacos. Thanks for a chance. Then I would make a roast beast. I’d make potato barley soup! I’d definitely be having fun making yogurt too! Wow! 9 years! I’m so glad I came across your blog!! Also…I’ve been dying to get the instant pot for over a year now!! SO exciting about the giveaway! My mom’s meat sauce, she always made it in a pressure cooker. I would make a roast with carrots, onion and potatoes! Yum. The first recipe I would make is Beef Stew. My first recipe would be a beef stew. I’d make meatloaf and potatoes. I think I’d try to make a beef roast recipe first. I’d love to try a cheesecake! I WOULD MAKE CHILI OR BBQ PULLED CHICKEN, OR SOME BIRRIA. I’d make pulled pork tacos! And a roast or ribs! I would make a nice and hearty beef stew. The first recipe I would make would be Chicken and Dumpling. I’ll be making hard boiled eggs . I would make an Irish Beef Stew! I would make beef stew. Thank you for the giveaway! I would look for some kind of chicken and rice recipe! The first thing that I would make is spicy no bean chili. Right now I have Pot Roast in my slow cooker, so I will say Pot Roast. The first thing I would make is Chicken Stew. Not sure maybe chicken and bbq rice. I would make zuppa soup. The first thing I would make is some Jambalaya. I would make a pot roast with veggies. I think I would start with a pot roast. I will be making Instant Pot Macaroni and Cheese. I think the first thing I would make is white chicken chili! Youve got some great recipes. I’d have to make those cinnamon apples first. I would make Kahlua Pork! My first meal will be swedish meatballs! I would make chicken noodle, thanks for the nice give away. I think my first thing to make would be a pot roast. Thanks for having this contest! The first recipe we will make is a Guinness Beef Stew !!! I would like to make my great recipe of split pea soup with ham. I saw a recipe the other day for instant pot egg roll. Wow! First on the list! I would make a pork roast. I would put potatoes, carrots, and onions around the roast. I would first make a pot roast for the family its there favorite meal. I already own an Instant Pot, I bought myself one over the Summer and I absolutely love it! I use mine all the time 😀 I want to win this one so I can gift it to my little sister for Christmas, because I know she will love it just as much as I do!! You are the best sister ever! Good luck! I am so ready to make some beef stew for those chilly evenings! I would make beef stew the first time. I think I would make chicken and dumplings or a pot roast. I would love to try the broccoli and beef.